Krell Foundation 7.1 AV processor lands in the UK for £6500 | What Hi-Fi? 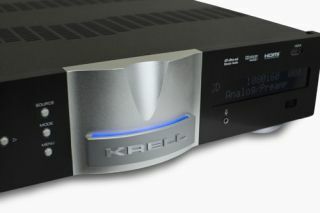 We first clapped eyes on the Krell Foundation at CES back in January, and we're impressed enough then to vote it one of our Stars of CES 2013. It's now landed here in the UK courtesy of distributor Absolute Sounds, with a price tag of £6500, and will be available from July. For the money, you get a 7.1 channel preamp/processor with 'state-of-the-art digital audio processing' and the legendary build quality for which the Connectcut-based company is known. Onboard processing handles Dolby Digital, Dolby Digital Plus, Dolby TrueHD, DTS, DTS-ES Discrete, Matrix and DTS-HD Master Audio soundtracks. Post-processing modes inlcude Dolby Pro-Logic IIx and DTS Neo:6, as well as Krell' proprietary surround modes 'Party', 'General Admission', 'Front Row' and 'On Stage'. 3D TV passthrough comes as standard, along with automatic set-up and room EQ, 10 HDMI 1.4a inputs, a pair of HDMI outputs (both of which feature Auto Return Channel (ARC) so a TV or display can send audio back down the cable to the processor. One new development is 'Intelligent HDMI' switching, which Krell says is "a combination of circuitry and innovative software that optimises HDMI operation". All 10 source inputs are permanently active, so channel, source, video resolution and audio format changes are instantaneous. Additional features include three optical and three coaxial digital inputs, six analogue video inputs (three componnet and three composite, transcoded to HDMI), ethernet control, balanced and unbalanced outputs, an analogue zone 2 output and dual subwoofer outputs.